The Atlas V rocket with the Wideband Global SATCOM satellite rolls out to Space Launch Complex-41 from its Vertical Integration Building at 10 a.m., Oct. 9, 2007 for a planned Oct. 10 launch from Cape Canaveral Air Force Station, Florida..
TheAtlas rocket program looks to return to its successful ways this week,launching a powerful U.S. military communications satellite Wednesday nightwith a tried-and-true engine valve instead of a newer design blamed forcreating serious problems during the last ascent four months ago. 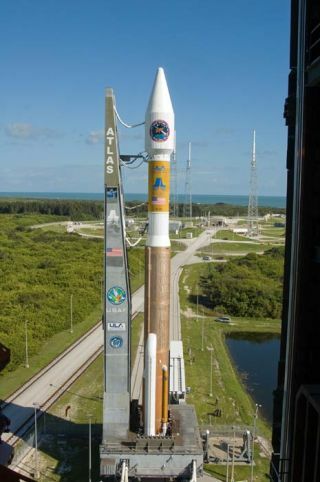 Atlas enjoyed a spotless14-year consecutive success record covering 80 flights, but that score card washit with a major blemish June 15 when a leaky fuel valve caused an Atlas 5rocket to fallshort of its intended altitude. A pair of classified U.S.national security spacecraft deployed from the rocket's Centaur upper stageinto a lower-than-planned orbit that day. Government officials said afterward,in essence, that the launch wasn't perfect but it wasn't a complete failureeither. Throughout the summer,sky-watching hobbyists who routinely track all sorts of satellites reported thesecret duo from the botched launch were gradually boosting themselves higherand higher. Ted Molczan, a respected satellite observer, says the craft havemade up about half the distance toward the expected launch altitude so far. While the satelliterecovery work has been underway, rocket-maker United Launch Alliance, enginebuilder Pratt & Whitney Rocketdyne and the Air Force have investigated theascent incident and ordered a corrective fix to ensure upcoming launches won'tsuffer a similar mishap. Several factors hadcoincided to create the problem, officials concluded, including an unusuallylengthy firing by the cryogenic RL10 main engine during the launch sequence.But the liquid hydrogen fuel valve design -- a new version with only ahalf-dozen previous flights to its credit -- was at the heart of the problem. "The investigationdetermined that the fuel inlet valve on the RL10 engine system failed tocompletely close after the first main engine cutoff on the Centaur upper stage.That happened because its closing force was not sufficient," Jim Sponnick,ULA's vice president for Atlas programs, said in an interview Friday. "We learned that wehad a combination of higher than expected friction forces inside the valve, aswell as the effects of a very cold temperature on the helium that is used tooperate this valve. This particular mission required a longer than average timefor the first burn, which resulted in the liquid hydrogen flowing to the valvefor a longer than typical period of time, which then decreased the temperatureand increased the frictional forces within this valve. "And those factors incombination led to the point where the valve did not have sufficient force toclose itself." After the Atlas 5 rocket'sfirst stage had fired and dropped away, the Centaur ignited its engine fourminutes into flight as the booster soared northeastward from Cape Canaveral ona trajectory experts believed illustrated that the clandestine payload was twoocean surveillance spacecraft. The initial firing by theRL10 powerplant lasted about 15 minutes to reach a temporary parking orbit. Asthe cryogenic engine shut down, the fuel valve tried but failed to closecompletely. The valve reached"near-closure but not full-closure," Sponnick said. That left a pathway for therocket's precious liquid hydrogen fuel supply to slowly escape as the Centaurquietly coasted in space for nearly an hour. When the Centaur restartedthe engine to deliver a final propulsive push for its payload, there wasn'tenough fuel left in the tank to complete all of the mission's second burn.Although the firing seemed only fractionally short, roughly four seconds, therocket simply could not achieve the desired orbit. The satellites separatedfrom the rocket and officials in the Atlas control center cheered, not fullyaware that the launch had been crippled by a fuel leak. "We did have someindications of that condition in real-time. There were several parameters onthe vehicle that were indicating temperature differences from normal. It wasnot known at that time that there would be an affect on vehicleperformance," Sponnick recalled. But the realization soonhit the team and efforts commenced to figure out what went wrong. "We've literally spentthousands of hours conducting very high fidelity tests to thoroughly understandthe cause, as well as to test the replacement valve," said Sponnick,adding that the testing occurred at Pratt & Whitney Rocketdyne facilitiesin West Palm Beach and ULA's sites in Denver. "We both developedvery high fidelity test rigs to subject the valves to very flight-likeconditions. With that high fidelity testing, we were able to replicate thefailure-to-close scenario. And we've also been able to use those testcapabilities to test the valves that will be flown." The remedy ordered forupcoming Atlas 5 and Delta 4 rocket launches -- both rocket families useversions of RL10 engines to power their upper stages -- is reverting back theprevious fuel inlet valve design that officials fully trust. "The upcoming missionsare not flying a new valve design, it's actually the valve that has flown formany years on prior Atlas flights and also on the Delta flights that have flownto date. Our testing, as a result of the investigation, has shown that theheritage valve design has larger closing force margins," said Sponnick. "And we've also takingseveral additional measures. We are performing a very high fidelity test of theheritage valve design that ensures that we are confirming prior to flight allof the opening and closing force margins for the valve. So we're doing a veryspecific test and we're also implementing some additional cycles of the valvein flight to provide even greater margin to close following main engineburns." Some may question why therewas a switch from the trusty old design to the new valve in the first place.But officials explained that they were forced to find another valve because thevendor was stopping production of the old device. "The manufacturer thathad supplied the valve in the past was essentially phasing out that productline. So we were developing a new design," Sponnick said. "For the next severalflights we do have in inventory the heritage valves that are being tested inthe manner we've described. We are developing several options for longerterm." The Atlas 5 rocket willresume launches Wednesday evening with a planned 8:22 p.m. EDT (0022 GMT) liftofffrom Cape Canaveral's Complex 41. Riding atopthe 19-story rocket will be the U.S. military's first Wideband GlobalSATCOM communications satellite. "Mission success isour absolute No. 1 priority. And that's exactly what we applied to thiscorrective action. We continue to be driven by technical success, not launchdates. So we are doing what we feel, jointly, is the right thing to make sureour customer -- the Wideband Global SATCOM program -- is going to get a greatlaunch come (Wednesday)," Col. Michael Moran, the Air Force's Atlas groupcommander, said in an interview Friday. "From my vantagepoint, I am more confident now than ever on the capability of that valve toperform as it's expected in flight. I'm absolutely confident that theprocessing that we've gone through, the reviews that we've gone through and thetechnical analysis that we've gone through responding to the anomaly in Junehas been comprehensive and effective. I have absolutely zero concern about theperformance of that vehicle making its way to orbit." "And I'll echothat," said Sponnick. "We're extremely confident in the understandingof the anomaly and the thoroughness of the correction actions that have beenput in place." This will be flight No. 11for the Atlas 5 rocket fleet, and everyone involved hopes and expects to see asuccessful outcome when the massive satellite is deployed into asupersynchronous transfer orbit a half-hour after liftoff. You can follow Wednesday'scountdown and launch in our Mission StatusCenter. We'll have live play-by-play reports throughout the evening. The status center also hasan update on the launch delay from Tuesday to Wednesday.